Gymnastics has always been a very popular sport for people of all ages. As it is an Olympic sport it has a large profile which makes people gravitate to it. It is especially popular with parent as it offer their kids a chance to compete and helps build core strengths important for physical development. What makes it great is that there are many local gymnastics academies that school children can attend for the development. Adults can of course also attend as they usually have adult classes as well for those just trying to get fit or agile. Southern cross mats is proud to offer quality mats for gymnastics training. The gymnastics mats we provide offer help to create a safer environment for you to train in and are adaptable. They are suitable for different training areas depending on your training needs. We do our best to help you to meet your specific needs. But why are mats so important? 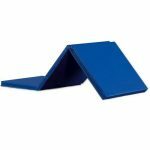 When doing gymnastics, you need to have the security and safety that a good gymnastics mat can provide. The last thing you want to do is expose yourself to injure during training. No matter what kind of routine you have and follow, you need to be sure that you can rely on the mat underneath you. Without that peace of mind, it is difficult to commit to the kind of training needed to ensure success in what is a competitive sport. Without a suitable mats you can even get hurt unnecessarily. It is best to try and limit and injury when practicing your gymnastics routines which is why safety flooring is recommended. We make sure that each of our gymnastics mats is made using the best quality materials possible. This provides buyers like you with a product that can be relied on when you need it most. We have a couple of Gymnastic mats on offer for you to chose from. They include our roll out mat and a foldable mat (or 3 fold mats). Which mat is suitable for you will depend in how you plan on training and where. Read on to find out more about them. Our roll out mats are generally used in more professional circumstances. If you have a professional gym and need to cover a large area the these mats are ideal. When needed they can be simple rolled out to cover the surface needed. They can also be connected together using a velcro strip. We have three different sizes of roll out mats that you can purchase. The smallest is our 3-meter roll out mat. It’s a size that will be more than big enough for the majority of gymnasts and buyers out there. But if you need something bigger, you might want to consider our 6-meter or 12-meter options. These provide far more room, and, therefore, they’re more adaptable and offer a few more possibilities. 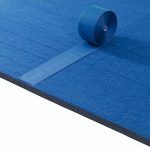 All of our roll out mats are blue, and they’re made from EVA foam and felt. They’re 35mm thick, meaning that they offer plenty of protection for you when carrying out your gymnastics routines. These mats are popular with training organisations large and small. As far as we’re concerned, our roll out mats are the ultimate mats, and they’re all you’ll ever need. The felt finish makes them attractive and pleasant to the touch. You won’t find a gymnastics mat that’s more suitable for your gymnastics needs, no matter how hard you look. One of the great things about these mats is that they are so easy to roll up and store. They might be big when they’re rolled out and ready to use. But that doesn’t mean that they have to take up space at other things. This is something that you should keep in mind and be aware of. You can carry them to and from where you practice very easily as well. As any gymnastic coach will know, that’s a major blessing in itself. It makes using the mat and incorporating it into your life a lot simpler for you. They can also be installed permanently if required. While we only stock these mats in blue they are also available in other colours on special order. Additional charges and lead-times may apply should you require a custom colour mat. Also colour might be limited by availability of material. Our 3-fold mats offer something a little different, and these mats can be very useful for a variety of different uses. Many people use these mats in the home when they want to get active. They come in a variety of different colours. You can choose between black, blue and red options. They weigh only 3.5 kg, meaning they’re kept lightweight and easy to carry around. The dimensions of these mats are 60 x 60 x 16 cm. There are three separate parts to the mat, and it’s this that allows them to be folded up neatly and simply. They can then be stored very easily and simply in the home. That’s something that’s really important, so take it into account when you’re making your choice. The convenience they offer makes them ideal for all kinds of gymnasts. They also look great and offer comfort when they’re used. They can also be used whenever you want to get active and do some gymnastics. Their tough design and high-quality materials mean that they can handle heavy usage and being moved around a lot. Your mat will remain strong and durable for a long time to come. Take advantage of this and take your 3-fold mat wherever you need to and wherever you want to use it. There are no limits to what you can do with it. If you have anything else that you want to know about our mats, you should get in touch with us. Our team is always more than happy to answer any questions you might have and give you all of the vital information about the mats we’re proud to sell. We can even help point you in the direction of the mat that will be best for you. If you are a reseller that requires more colour options then we can arrange that for you. For special order 3-fold mats there is an extended lead-time as these mats are manufactured off-shore. We also offer reseller pricing but minimum order quantities may apply. Souther Cross Mats have warehouse in Melbourne and Sydney. We usually have our mats in stock. If they are not in stock then they can be ordered or we will hold incoming stock for you. Our mats are very popular so they tend to sell out fast which makes reserving our mats a good idea. While training mats offer you protection and help reduce injury during training they are no substitute for common sense. It is important that you follow a well thought out plan that takes into account the safety of the participants. While mats can assist will general falls and stumbles users must avoid falling on their head, neck, spine or in any other precarious positions. Furthermore children should always be supervised by an adult whilst using our mats. Contact Southern Cross Mats for all your training mats needs. We have a large range of safety mat option which are suitable for many different activities. SC Mats are the preferred supplier for organisation through Australia.